The fresh ingredients, wine and artisanal delights of the Cowichan Region are the perfect complement for creating exceptional food for exceptional people! Thank you for a lovely cake – delicious and the roses had a lovely scent. It was the perfect addition to the bridal shower. through the sponsorship of the jury lunch is greatly appreciated. Thank you again Michelle for a great job. Hard to believe 10 years has gone by so fast since your debut! Best wishes from the family. Thank you so much for helping surprise my lovely wife. Your yummy food helped make the night special! We both so appreciate you fitting us into your busy schedule! Use me as a reference anytime. Thank you so much for all your work to make Tracy’s 50th so special. From your menu suggestions, to logistics through to our first bites of your delicious creations – the whole “Art to Eat” experience was fantastic! “Art to Eat” began with a wedding cake in 2002. From the beginning our reputation speaks to providing our customers with unique menus using quality local, organic ingredients (when available) that are beautifully presented, palate pleasing and with your budget in mind. Art to Eat is known for catering your special events, weddings, parties, luncheons, custom cakes and baking. Attention to detail and always mindful of dietary concerns are an important part of my business. Whatever the occasion we bring the tastes to savour and the sights to delight! Serving Vancouver Island and Lower Mainland communities. We look forward to making your next event not only special but unforgettable. 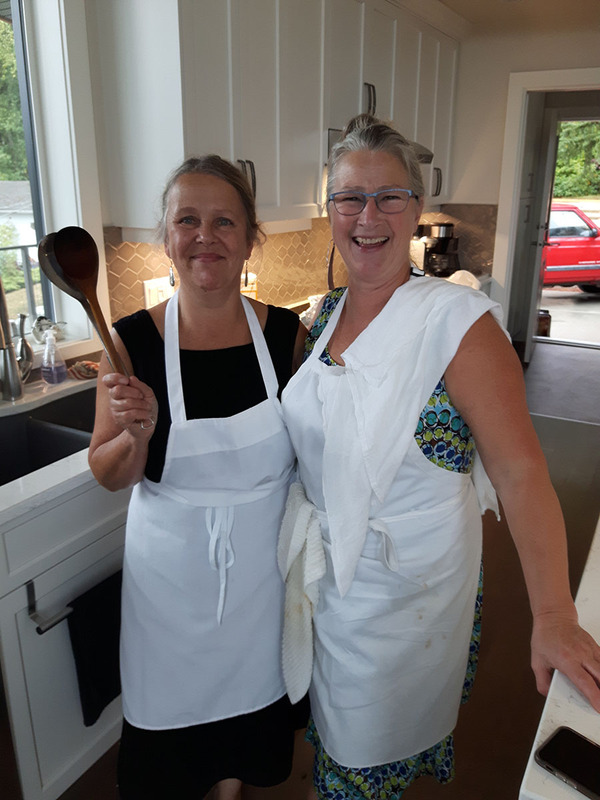 Michelle Plain (right) with kitchen & catering helper Leslie (left). ©Art to Eat. All rights reserved.